Make a simple accordion book using postcards as the front and back cover. Here is a postcard accordion that I made after a visit to Maui. 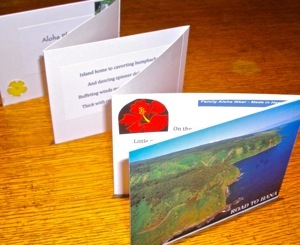 I chose cards of a favorite place, the road to Hana. I cut two lengths of legal size white cardstock, the same height as the postcards, and folded them into sections the same length as the cards. I joined the two lengths with an overlap of 1/2 inch of paper, glued along a folded edge. Then I glued the ends to the insides of the postcards. I ended up with a six-page accordion with postcard covers. This road to Hana winds back and forth along the magnificent Maui coast. You can see the dashing surf of the blue Pacific on one side, and on the other side there are waterfalls cascading down the mountains, close by the road and also in the far off distance. The road winds back and forth in a tight rhythm, and the pounding of the surf and the rushing of the waterfalls have you feeling the road like it's the beating of an ancient primal drum, or maybe it's just the beating of your heart as you gasp at the breathtaking scenery. Stopping at the beaches and waterfalls on this road inspired the poem that is pasted into the panels of this book, along with cut outs reminding me of Hawaii. See also Book-Making on the Activities and Crafts page.